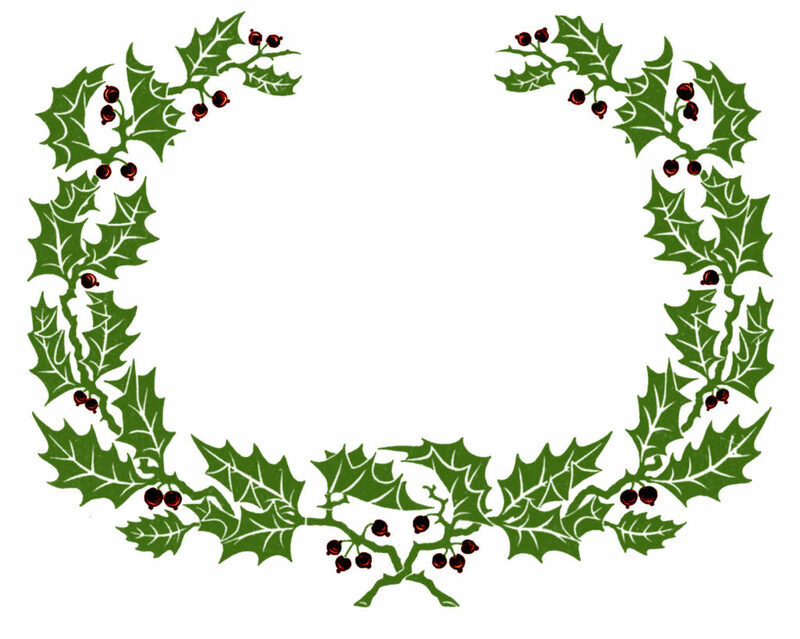 Today we’ve put together this collection of lovely Christmas Wreath Frame Images. 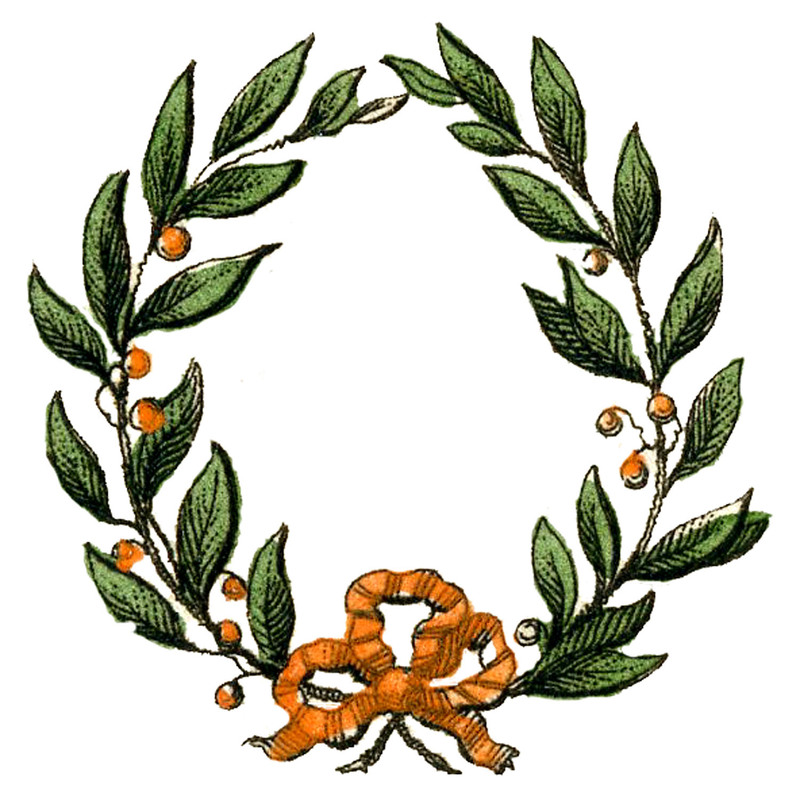 Included are some beautiful Laurel Wreath Images, Holly Wreaths and even a Poinsettia Wreath! These beautiful Christmas Wreaths make great Graphic Frames for your Holiday Projects or Designs. You could use them to make pretty Labels or Gift Tags, for Scrapbooking projects or Web Design. They are all wonderful Antique and Vintage High Resolution Images scanned from my collection. 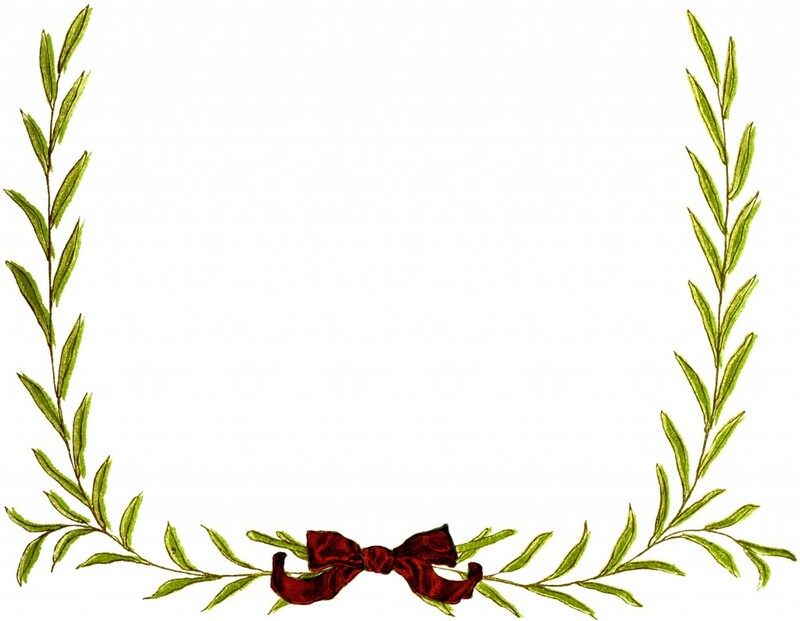 These are some wonderful Simple Christmas Wreath Frame Images! 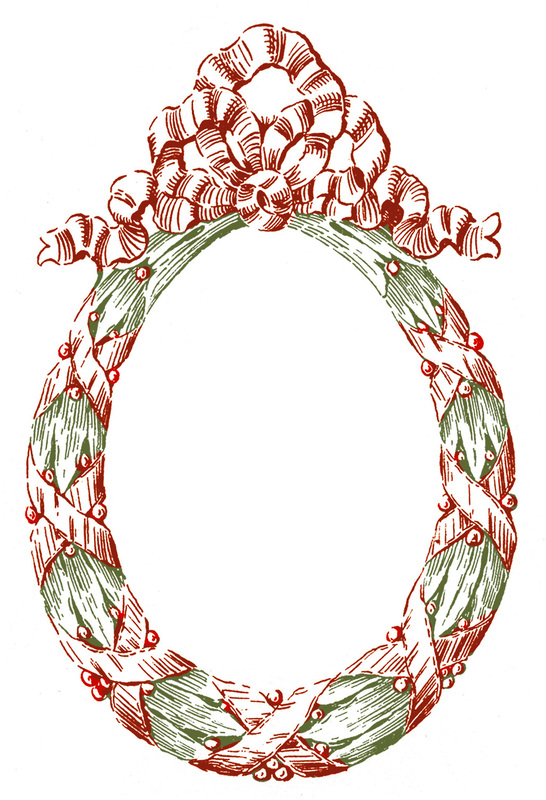 These wreaths were illustrated by Kate Greenaway and the book they were scanned from dates to 1902. They are simple, but elegant and charming and I thought they could be quite useful for the Holidays. The original image is the wreath with the blue bow below, but I made a version with a red bow that you can use for Christmas. I think they would make really pretty Handmade Gift Tags or Labels! These were scanned from the book that Lady Victoria Herbert once owned. You may recall the story that I told in a previous post, about how Lady Herbert actually lived in Highclere Castle, which is where Downton Abbey is filmed!! You can find that post, and another wonderful Kate Greenaway Image HERE. This is the original version with the blue bow, which is also very pretty! 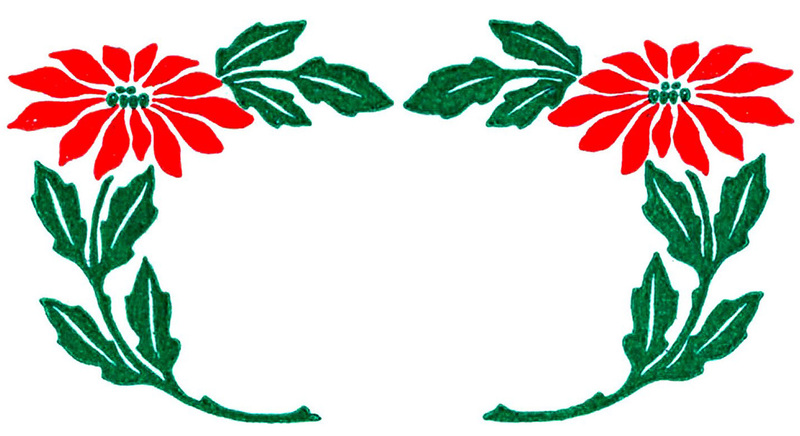 This next one is a wonderful Early Primitive looking Graphic of a Green Wreath with Red Berries and a Red Bow! This one was hand colored a long time ago, and you can see that it’s not perfect, but I do think that’s part of it’s charm! The wreath came from an Antique English Heraldry Print. 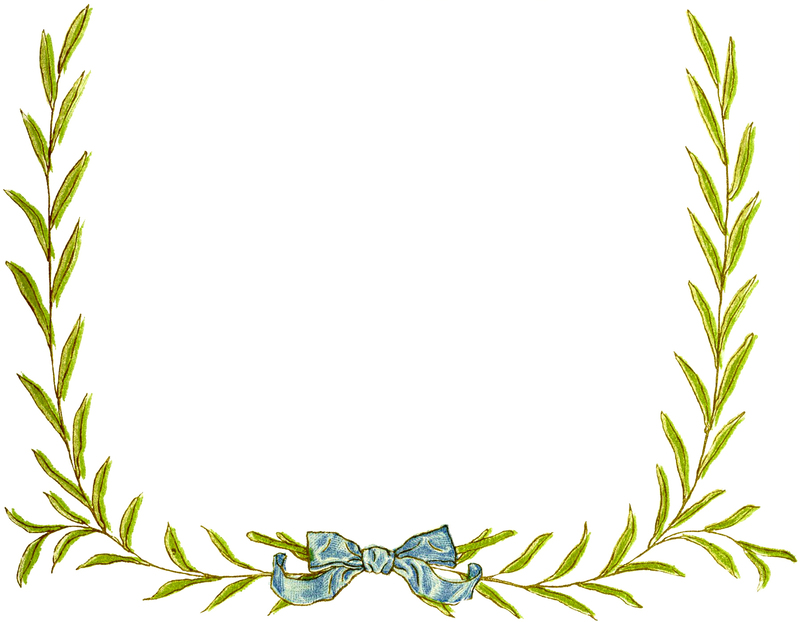 This is a wonderful Classic Laurel Wreath Frame! 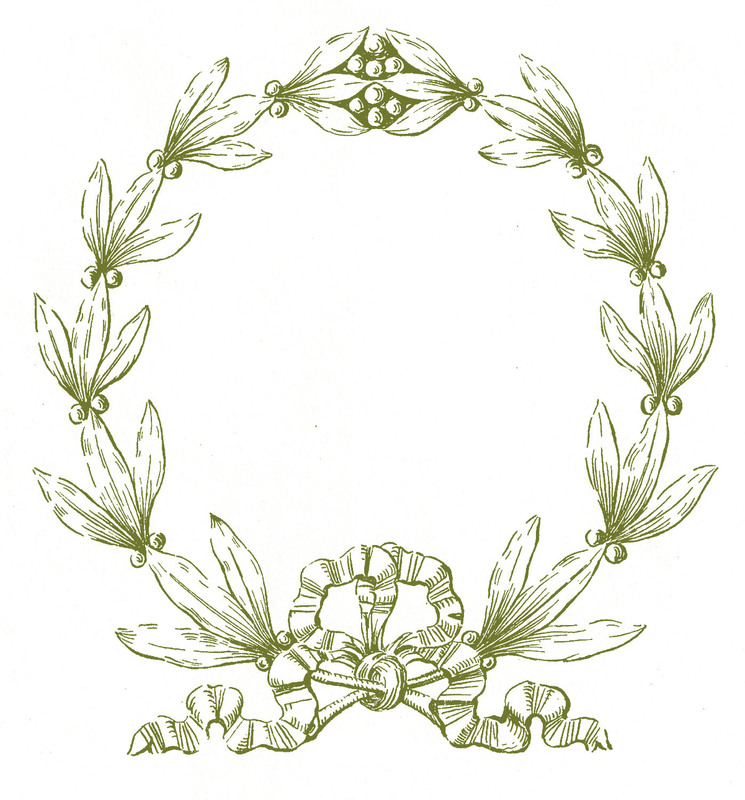 The Wreath has tiny delicate berries on it and a pretty bow at the bottom. I thought this would be a nice to one to use in your Christmas Projects. Wouldn’t it make a pretty Gift Tag?! I’ve included a few color options for you, including this green one that you see above. And this is the original black and white design. This one would make a nice Photoshop brush! This Vintage Graphic Frame is a classic looking Oval Wreath! 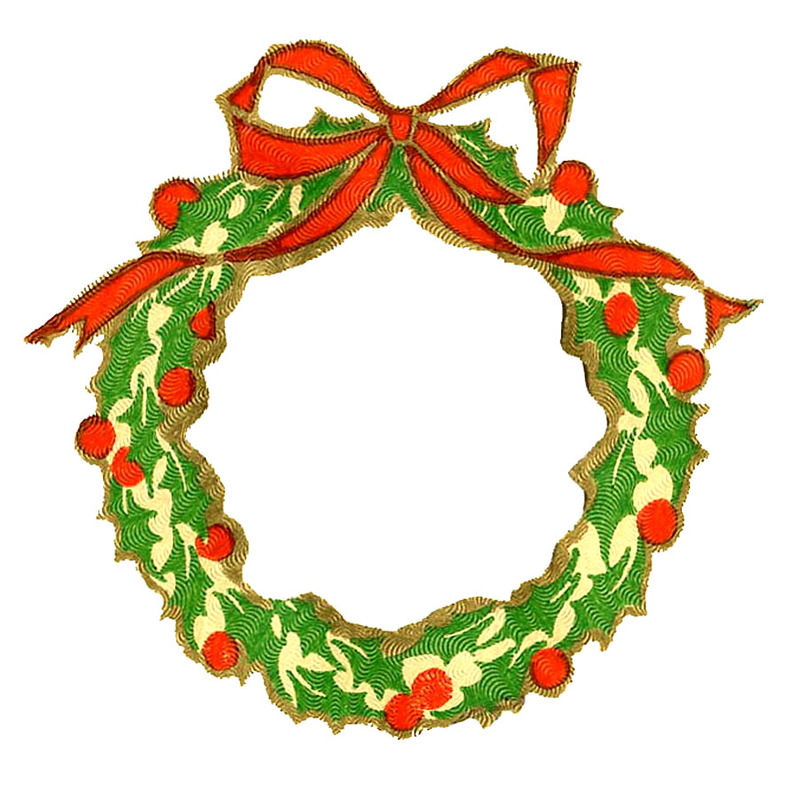 The wreath has berries, a ribbon that crisscrosses along the whole wreath, and a big bow at the top! I’ve created multiple versions of this one as well so that you can use what works best for your project. The solid Green one is above. This is a pretty Vintage Wreath Frame made up of Green Holly Leaves and Red Berries! This one comes from a 1915 Type book. I thought this one had a useful shape to it, you could easily add some text to the center of this image. And then we have this little cutey! This vintage Christmas wreath comes from an old fold out card and this cheerfull little Green, Gold and Red Wreath was on the cover of the card. The card probably dates to around the 1920s-1930s. I love the texture and bright colors on this one! Lastly we have this lovely Poinsettia Wreath from an Antique Type Book. Two bright Red Poinsettia Flowers, with Green Leaves, are bending towards each other to make a pretty little graphic frame. I hope you enjoyed this sweet collection of Christmas Wreath Frame images and that you can use them in your Holiday Crafts! 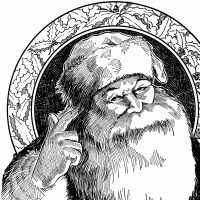 You might also like our Christmas Tree Image Collection HERE. « 7 Christmas Birds Images – Vintage Charm! The simplicity of this is really appealing. Thank you for both versions. So useful! I love these Karen! thanks so much! Some of these are really different! I love the simplicity of the poinsettia and the Holly Wreath – but all are wonderful images. Thanks for sharing!